Israeli Prison Service (IPS) transferred 40 Palestinian detainees from Nafha, Rimon and Negev jails to Ohalei Kedar detention center in Beersheba. Voice of Prisoners radio reported on Thursday that the IPS evicted Section 8 in Ohalei Kedar detention center for the transferred captives. No preparations for the new detainees were made, it pointed out. Only four prisoners were known among the transferred captives. They are Sheikh Raed Saadi, Yusri al-Masri, Samer Issawi, and Azzam Diyab. Five Palestinian hunger striking detainees were injured after Special Forces of Israeli Prison Service (IPS) raided Rooms 1, 2 and 3 in Ashkelon jail. The wounded captives, who sustained bruises in their heads and faces, were taken to the prison clinic for treatment. Detainees and Ex-detainees lawyer, Karim Ajwa, who visited Ashkelon jail said, in a statement on Thursday, that the striking captives are suffering very hard conditions and daily provocative search operations. He quoted the hunger striking detainee, Naser Abu Hmeid, who is serving a life sentence, as saying that the IPS held trials to the striking prisoners and issued penalties against them including ten days of isolation and fines estimated at 500 shekels each. Other punitive measures included withdrawing salt from the striking detainees. The IPS pursues penal measures against Palestinian striking prisoners in order to pressure them to break the hunger strike, the lawyer pointed out. Mass detentions of over 400 Palestinians were the result of a computer algorithm based on their social media usage, explains TRNN’s Shir Hever. Shir Hever is an Economist working at The Real News Network. His economic research focuses on Israeli occupation of the Palestinian territory; international aid to the Palestinians and to Israel; the effects of the Israeli occupation of the Palestinian territories on the Israeli economy; and the boycott, divestment and sanctions campaigns against Israel. His first book: Political Economy of Israel’s Occupation: Repression Beyond Exploitation, was published by Pluto Press. A general strike has swept the occupied West Bank and the blockaded Gaza Strip on Thursday in solidarity with the Palestinian hunger strikers in Israeli jails. 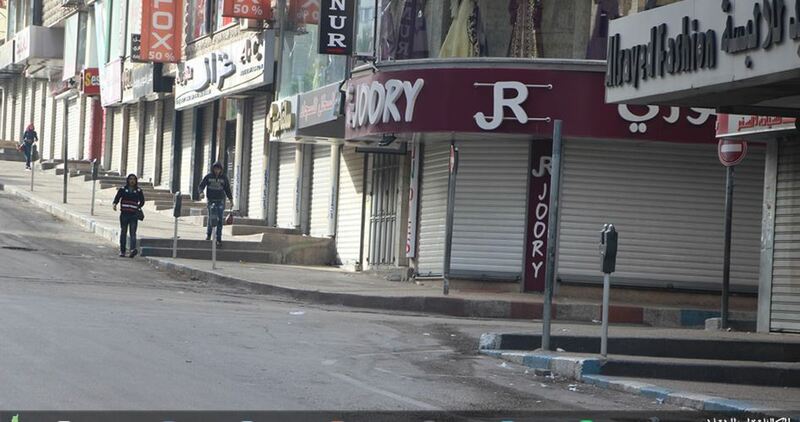 Commercial shops have shut their doors since the early morning hours. Solidarity banners and hunger strikers’ pictures figure everywhere across the streets. Public means of transport, academic institutions, banks, and private companies have also gone out of operation in several cities. Calls have, meanwhile, been launched by youth activists for stepping up protest moves across all flashpoints with the Israeli occupation. Some 1,500 Palestinian detainees joined a mass hunger strike that has swept Israeli jails since April 17 to protest mistreatment and press for basic human rights. The Bethlehem office of the Palestinian Prisoners’ Society (PPS) has reported that Israeli soldiers abducted, on Thursday at dawn, a young Palestinian man, from Beit Fajjar town, south of Bethlehem, in the occupied West Bank. The PPS said the soldiers invaded and searched homes and interrogated several Palestinians, before abducting a young man, identified as Ahmad Abdul-Rahim Deeriyya, 28. The young man was cuffed and blindfolded, before the soldiers moved him to Etzion military base and security center, south of Bethlehem. Israeli soldiers invaded, on Thursday at dawn, Beit Dajan village, east of Nablus, in the northern part of the occupied West Bank, and abducted a university student from his home. Media sources in Nablus said the soldiers broke into and searched a few homes in Nablus, and abducted Naseer Radwan Abu Thabet, who is a student at the Najah University, in the city. 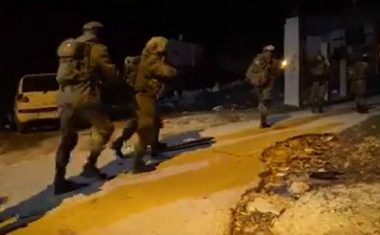 Also at dawn, the soldiers abducted five Palestinians, including a child, in the West Bank governorates of Qalqilia and Tubas. In related news, several illegal Israeli colonists attacked many Palestinian cars in the northern West Bank governorate of Jenin, causing damage, in addition to assaulting a man after pelting his car with rocks, leading to injuries that required hospitalization. Israeli soldiers abducted, on Thursday at dawn, five Palestinians, including a child, in the West Bank governorates of Qalqilia and Tubas. 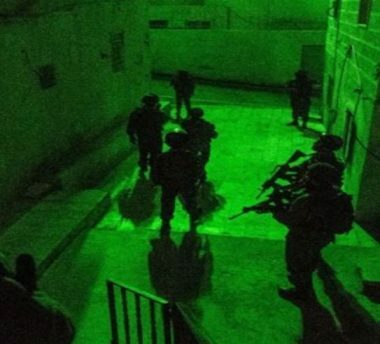 The Qalqilia office of the Palestinian Prisoners’ Society (PPS), in the northern part of the occupied West Bank, said the soldiers invaded Kufur Qaddoum town, east of the city, searched several homes and abducted two Palestinians. It identified the abducted residents as Ala’ Saed Obeid, 15, and Ali Mohammad Amer, 25; both were cuffed and blindfolded before the soldiers took them to an unknown destination. In addition, the soldiers invaded Tubas city, in the northeastern part of the West Bank, and Tammoun town, south of Tubas, also violently searched homes, and abducted Faze’ Sawafta and Osama Sawafta, both from Tubas, in addition to Loot Bisharat, from Tammoun. Israeli court sentenced Wednesday morning the Palestinian minor Malak Suleiman, 17, to ten years imprisonment over an alleged stabbing attack. The girl was detained in February 2016 near the Old City in occupied Jerusalem for allegedly trying to stab an Israeli soldier. Since then, she was transferred to different Israeli prisons, most recently to HaSharon prison. Her detention was extended more than once till the court’s imprisonment order. The Israeli District Court in occupied Jerusalem sentenced, Wednesday, a Palestinian teenage girl to ten years in prison, after convicting her of “an attempted stabbing attack,” in the city. The verdict came after Israel delayed her court hearings 24 times since he abducted in February 2016. The court session was held after repeated delays and rescheduling by the Israeli Prosecutor’s Office, then following Wednesday’s hearing, the teen, identified as Malak Salman, 17, was sentenced to ten year in prison. Malak was taken prisoner, on February 9th 2016, in Bab al-‘Amoud area, one of the famous gates of the Old City of occupied Jerusalem. Amjad Abu Assab, the head of the “Jerusalem Detainees’ Parents Committee,” denounced the verdict and considered it another Israeli assault on children in occupied Palestine, especially in Jerusalem. Abu Assab criticized various international legal and human rights groups for what he called “complicity with the Israeli crimes,” especially since Israel’s ongoing aggression and occupation are serious violations on International Law, the Fourth Geneva Convention and all related treaties. He also stated that detained women are held in prisons far away from their families, and are living under very difficult conditions, ongoing violations, and denied basic rights. It is worth mentioning that Malak was violently beaten up by the soldiers when they abducted her in Bab al-Amoud, causing various cuts and bruises. 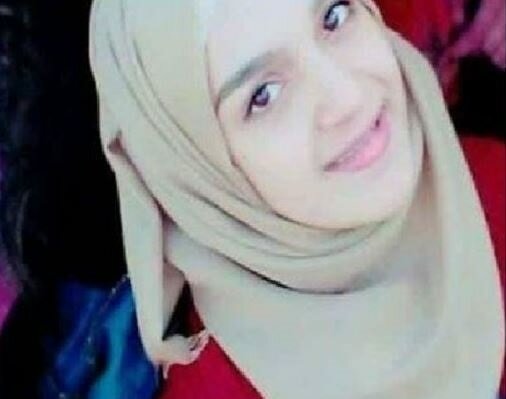 Since her abduction and imprisonment, Malak’s courts sessions have been delayed by Israel for more than 24 times, and she was continuously being transferred to various prisons; she is currently held at the HaSharon prison. The Palestinian Prisoners’ Society (PPS) has reported that Israeli soldiers have abducted three Palestinians in Zabbouba village, west of the northern West Bank city of Jenin, and one in Yatta town, south of Hebron, in the southern part of the occupied West Bank. 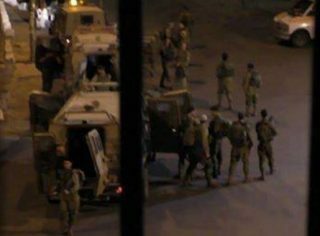 The Jenin office of the PPS said several army jeeps invaded Zabbouba, before the soldiers stormed and violently searched homes, and abducted Abdul-Nasser Mohammad Jaradat, 26, and Kamel Husam Jaradat, 20. It added that the soldiers also abducted Yasser Mustafa Hannoun, 21, after summoning him for interrogation in Salem military base and security center. In addition, the soldiers searched homes in Wad az-Zeitoun area, in the center of Yatta town, south of Hebron, and abducted Yousef Mohammad Najjar, 43. The Media Committee of the Hunger Strike reported on Tuesday that the health conditions of some of the Palestinian striking detainees in Israeli jails deteriorated after going on the strike for the ninth day in a row. In a statement on Tuesday, the committee warned the Israeli Prison Service (IPS) of the continuation of the escalated offensive practices against Palestinian detainees. It also charged the IPS with responsibility for the lives of striking prisoners especially the sick. Among the captives whose health conditions were worsened are three detainees: Maslama Thabet, Mohammad Abed Rabbuh and Amjad al-Namoura. The IPS deliberately carries out repeated transfers of striking detainees between Israeli different jails, the statement added. 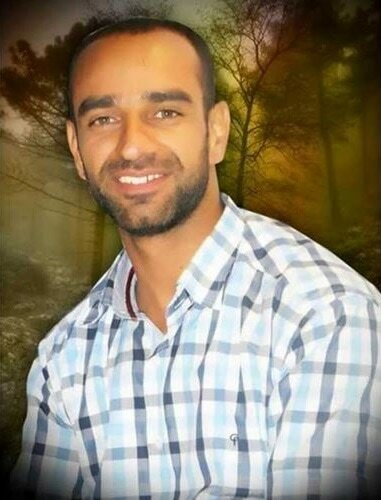 Prisoner Samer al-Issawi, member of the Central Committee of the Democratic Front for the Liberation of Palestine (DFLP) who had waged the longest hunger strike in human history, announced on Tuesday that he and new groups of prisoners will join the Freedom and Dignity hunger strike next Thursday. Issawi stressed in a message to the Palestinian people that the prisoners are united in their decision and determined to go on the hunger strike to clinch their fair demands. Ibrahim Mansour, head of the DFLP Prisoners Committee, said that they were informed that new groups of prisoners from Ofer, Megiddo, Negev and Raymond prisons will join the hunger strike on Thursday including Samer al-Issawi, the hero of the "empty stomach battle" who had gone on a 277-day hunger strike and forced Israel to respond to his demands. Mansour explained that a number of prisoners in Israeli jails decided to join the open hunger strike according to a unified national program in support for the striking prisoners against the Israel Prison Service. He called on the media outlets to be aware of the rumors and false news published in the Israeli media about the prisoners' hunger strike in an attempt to undermine their steadfastness and break their will. Israeli Prison Service (IPS) transferred on Tuesday the Palestinian hunger striking captive Maslama Thabet, from Ramin town in Tulkarem, to the Ramleh prison hospital. 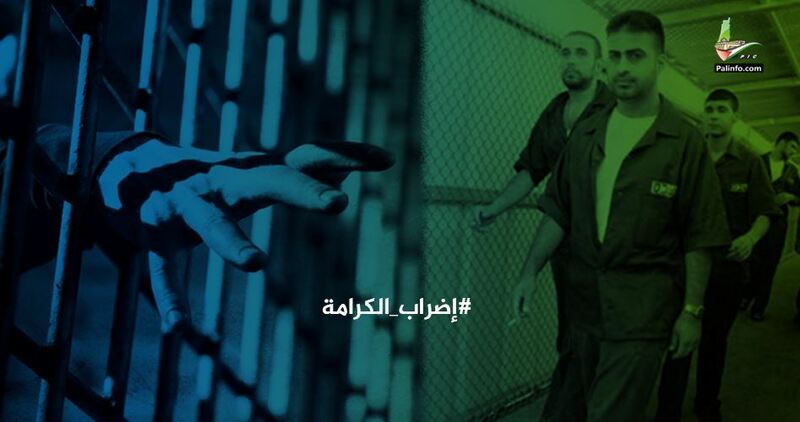 This followed deterioration of his health because of continuing a hunger strike for the sixth day in a row. 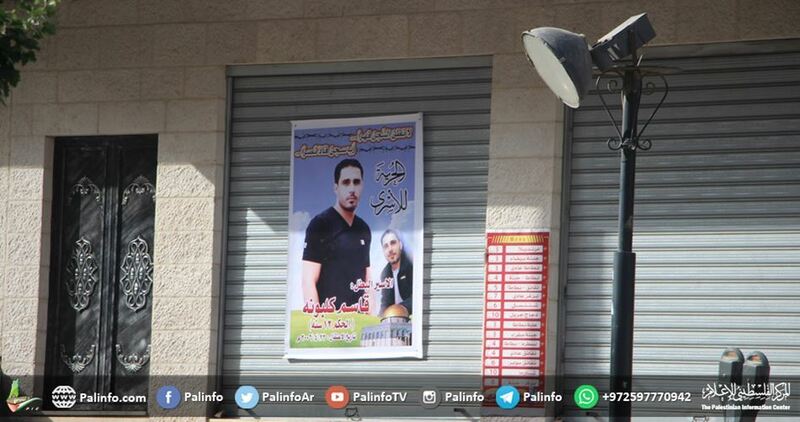 In a press statement, the family of the striking detainee held the Israeli occupation authorities (IOA) fully responsible for the life of their son who is serving a sentence of 25 years of imprisonment in Israeli jails. Maslama's father appealed to human rights organizations and the International Committee of the Red Cross as well as Doctors without Borders to urgently take action in order to save his son. The father threatened to prosecute the IOA if anything bad happened to his son. 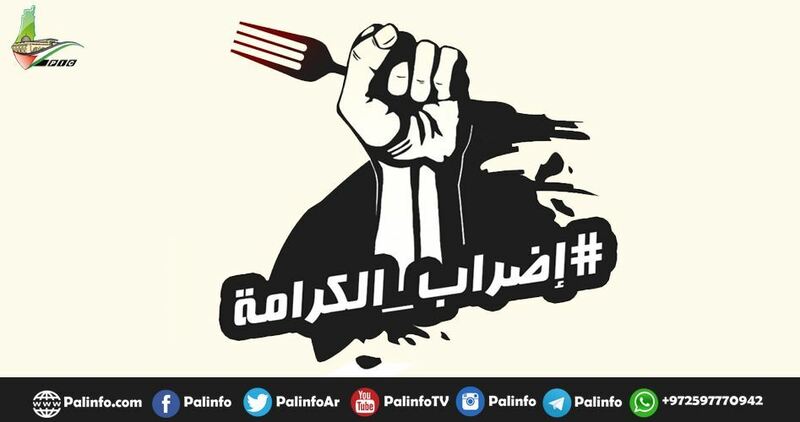 More than 1,500 Palestinian prisoners declared a mass hunger strike across Israeli jails on April 17 to press for basic human rights and protest the abject detention conditions. 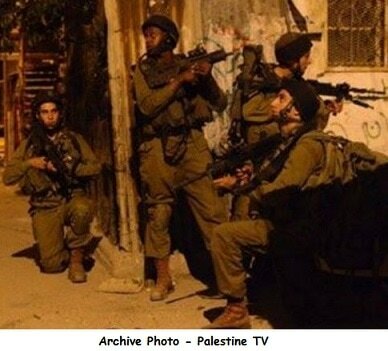 Israeli soldiers abducted, on Tuesday at dawn, at least fifteen Palestinians, including children, during massive invasions and violent searches of homes, in different parts of the occupied West Bank, the Palestinian Prisoners’ Society (PPS) has reported. In Nablus governorate, in the northern part of the occupied West Bank, the soldiers abducted Mahmoud al-Jibaji, Mohammad al-Asmar, Jamil al-Aqra’, Ezzeddin al-Aqra’ and Ahmad Abed, from the New Askar Refugee Camp, in addition to two other Palestinians from Huwwara town, south of Nablus city. 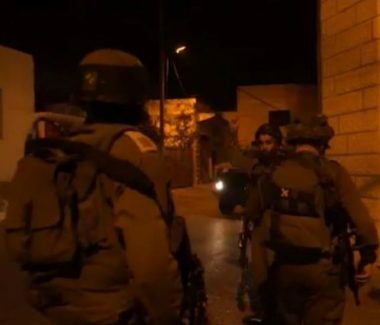 The soldiers also invaded Hares village, in Salfit, in the northwestern part of the occupied West Bank, searched homes and abducted one Palestinian. Furthermore, several army vehicles invaded Beit Fajjar town, south of Bethlehem, before the soldiers searched homes and abducted Khaled Hussein Deeriyya, 17, and Sanad Amjad Taqatqa, only 15 years of age who a former political prisoner. The soldiers also invaded the Deheishe refugee camp, south of Bethlehem, searched homes and abducted a child, identified as Mohammad Eyad al-Masri, 13. In Hebron, in the southern part of the West Bank, the soldiers abducted Khalil Mosallam Khalaila, after breaking into his home, in Sammoa’ town, south of the city, and violently searching it. In addition, the soldiers abducted Islam Nimir, from his home in the al-Am’ari refugee camp, and two others in Arik town and Um ash-Sharayet area, in the Ramallah and al-Biereh District, in central West Bank.